The band just announced the album’s release yesterday. 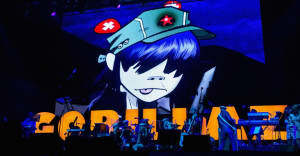 Gorillaz played their new album, Humanz, in its entirety on Friday night in London. The concert happened just a day after the band announced the album and released four new songs. Fans had one day's notice via a Facebook post that the band would be performing at a venue in London. The band streamed certain moments from the concert on Facebook Live. Watch the Facebook Live streams from the concert below.